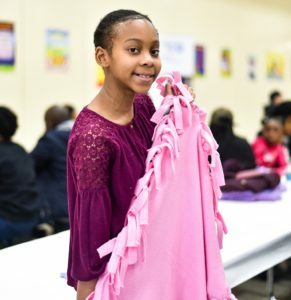 The cold, rainy weather didn’t stop Laila Sudler, 10, from finding a way to showcase her creativity while getting out of her house to volunteer during the Martin Luther King Jr. holiday. “It makes me feel like I’m making a difference by volunteering,” Laila said. 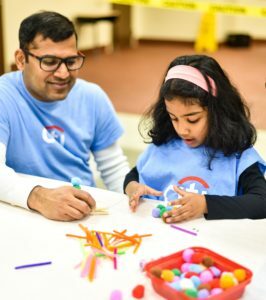 Laila and her mother, Nicole Sudler, were among the more than 1,200 volunteers who answered the call on January 19, 2019 to give back to the greater Charlotte community during the annual United Way MLK Call to Service. Each year, the event honors the life and legacy of Dr. Martin Luther King Jr. through family friendly service projects around the holiday that bears his name. The occasion is an opportunity to be intentional about United Way’s role in making the community better. With the help of United Way’s volunteer arm Hands On Charlotte, projects were organized at Renaissance West STEAM Academy in west Charlotte, East Mecklenburg High School in east Charlotte, Marie G. Davis K-8 School in South End and Blythe Elementary School in Huntersville. This year, there were many ways for volunteers to make an impact in the community. At each project site, volunteers created math and vocabulary cards for local schools, wrote encouragement cards for the Love In Action Project, assembled no-sew baby blankets for Baby Bundles and crafted bookmarks, bookworm buddies and bookworm letters for Promising Pages. Kiran Siripurapu, an employee with Citi, brought his family to the event for the second consecutive year. He enjoyed accompanying his four-year-old daughter, Suman, from project to project. “This is a great way for kids to volunteer. It’s a fun event for them while also allowing them to help out the community,” Kiran said. 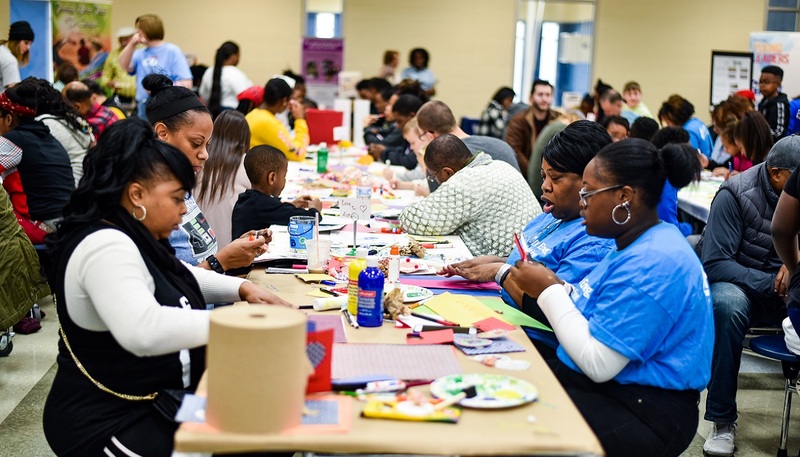 In addition to Citi, several companies had volunteer groups participate in the event – Atrium Health, Duke Energy, FedEx, Interior Architects and Johnson C. Smith University, among others. 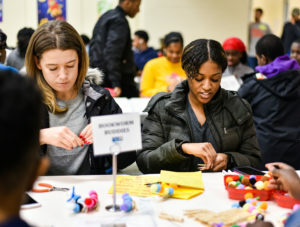 “It’s good to come together as a diverse group of people to honor Martin Luther King Jr., doing something good in support of a common cause,” said Demetrius Walker, a member of United Way’s Young Leaders Council. While MLK Call to Service delivers valuable assistance to nonprofit organizations, schools and other service providers, it also allows volunteers to begin the New Year by reflecting on the meaning of Dr. King’s life of service. United Way’s Hands On Charlotte provides year-round volunteer opportunities for individuals, groups and all ages. Learn about the many ways you can get involved here. Want to see more photos from the event? View our album here.